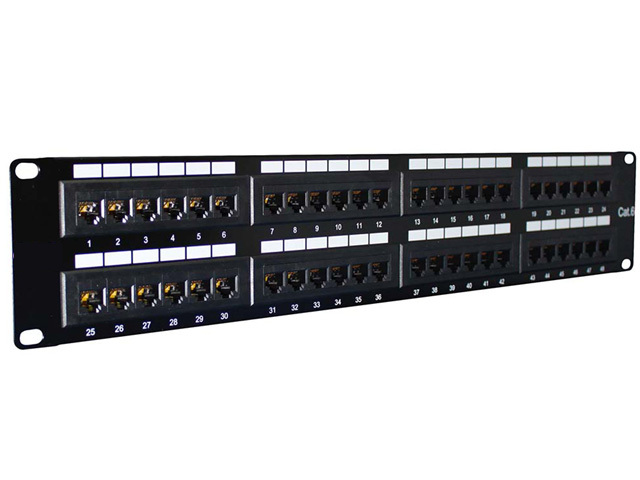 Ready to work with multiple vendor's equipment, this patch panel is made for exceptional performance with black electrostatic powder-coated steel and 50 micron gold-plated contacts. Every panel comes with 110-type termination, while meeting and exceeding TIA/EIA-568-B Cat6 connecting hardware specifications. The clear numbering on both the front and back of each panel provides a quick, easy way to identify cable runs. Broken or damaged connectors are no longer a problem; you can quickly and easily replace them with C2G, formerly Cables To Go, keystone jacks. The high density 19-inch panel design lets you mount to any standard 19-inch rack or cabinet, accommodates top, bottom or side cable entry, and also saves valuable space in your rack. It also has a write-on designation label with a clear holder on the front and the rear.